MIT Media Lab Identity from thegreeneyl on Vimeo. RatTales-Sydney from thegreeneyl on Vimeo. I have just finished a Chugnuts tumblr site. 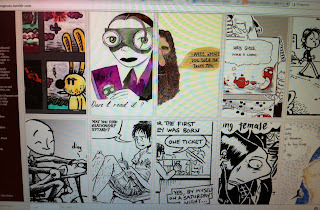 The aim was to create a quick-browse-able-showcase-portal representing comics artists I'd mentioned in a recent interview with Helena Turinski, editor of Illustrators Australia's Outline magazine. The focus of the article is the Sketchbook Project and the interview asked me about my contribution to a collaborative Melbourne (mostly) comics artists sketchbook for the project. The moniker "Chugnuts" has been coined to describe the loose and expanding group of comics artists (see links). I thought it would be good to have a one-click link to the fellow comickers whom I'd mentioned in the interview. I'm hoping the site will expand to include all Chugnuts folk as and when I have time. The interview is due to be published in the Illustrators Australia's March issue of Outline magazine (an IA members only resource).